School leaders in central Brooklyn met this month at the Brooklyn Brownstone School as part of District 16's district-charter school collaboration, where administrators exchange ideas and strategies. BEDFORD-STUYVESANT — In central Brooklyn’s District 16, superintendent Rahesha Amon hopes to foster links between district and charter schools. “There is real power when we come together and the best interest is in the children that we serve,” Amon said. The superintendent who covers Bedford-Stuyvesant and northern Crown Heights helped launch the city’s first partnership this past summer between district and charter schools, education officials said. Through the initiative, school leaders meet up to four times a year to share their best practices and work together toward common goals and community projects. The series follows in the footsteps of the Department of Education’s citywide district-charter partnership, which allows schools to collaborate and exchange ideas. Citywide, more than 100 district and charter schools have been partnered, officials said. After taking the reins of District 16 earlier this year, Amon hoped to build on the DOE’s larger plan and apply it to all 19 of her schools, she said. The partnerships also came on the heels of some parents’ concerns that there were too many charters in the district. “People just weren’t working together. I don’t think there was any hostility, but it was the same feeling that people have throughout this city, kind of just this mystery around what’s happening in charter schools,” Amon said. The 19 district schools and five charters are involved in one of four groups set up to implement progressive enrichment models, build teacher leadership, partner with parents and build a community garden. During the school leaders’ gatherings, administrators share what resources and steps may work or fail for them and brainstorm ideas to tackle challenges. “If you have this phenomenal dance teacher and a group of kids who want to do something with that, let’s combine,” Amon said. “Maybe I have robotics and you don’t, so let's work together. Each group has goals it hopes to reach, such as a family fair in the spring and parent workshops. 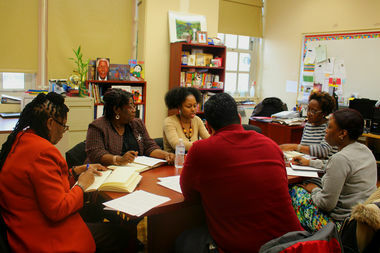 At a December meeting for the Partnering with Parents group, principals from Bed-Stuy schools gathered at the Brooklyn Brownstone School to discuss parent engagement, with Brighter Choice Community School outlining their step-by-step strategies. “I’m really excited to see how it’s going to grow and how we can not only learn from other schools in the group, but be able to invite other leaders in and be able to gather research,” said Madlen Read, director of operations at Excellence Girls Charter School. “Already we’ve gotten some great ideas about family communication,” she said, referencing apps to alert parents and families. Nakia Haskins, principal of the Brooklyn Brownstone School, added that students in the community often transfer between charter and district schools and working together to exchange ideas to cater to the neighborhood’s families is a powerful effort. “I really think the natural bridge is that we share space,” added Carlos Bermudez, who helps facilitate the groups on behalf of the superintendent’s office. “At the end of the day we’re [charter and district schools] all teaching the children of Bedford-Stuyvesant, Brooklyn, and one way or another we’re all facing the same challenges. In the near future, Amon says she would like to see the partnerships result in outcomes like a district-wide farmer’s market for children to learn entrepreneurial skills and a parent resource center. “There is power in us and the answers really are in the room," she said.